This one looked like the last one. The Celtics came out strong in Game 2, as they did in Game 1. Then, at halftime something happened. Maybe New York mixed up its defensive looks, or maybe Boston felt the effects of its thin roster, or maybe they just forgot how to shoot. But the Celtics once again put up one of the worst offensive halves in NBA playoff history, and even as the series shifts to Boston, this one feels out of reach. It's easy to blame this on personnel. Casualties of age and the salary cap, Boston entered this series with, frankly, not that many people who should be on the floor in a playoff game. There's no real center beyond Kevin Garnett, who played only 24 minutes with foul trouble. Jordan Crawford got major minutes off the bench. Brandon Bass again pulled down double-digit boards, but can't score. The second unit includes Chris Wilcox, Courtney Lee, and Shavlik Randolph. And, of course, the absence of Rajon Rondo, the man who makes it all go. J.R. Smith called the Celtics "a little fuzzy up top on who they want to get it to and why" without Rondo. "When Rondo is out there, they are in a certain flow," Smith added. "When he is not out there, they sort of don't know who to go to or [what] plays to run." The Knicks have capable bodies everywhere. Three point guards, including Raymond Felton, who poured in 16 points, many of them during a game-sealing 27-4 run. 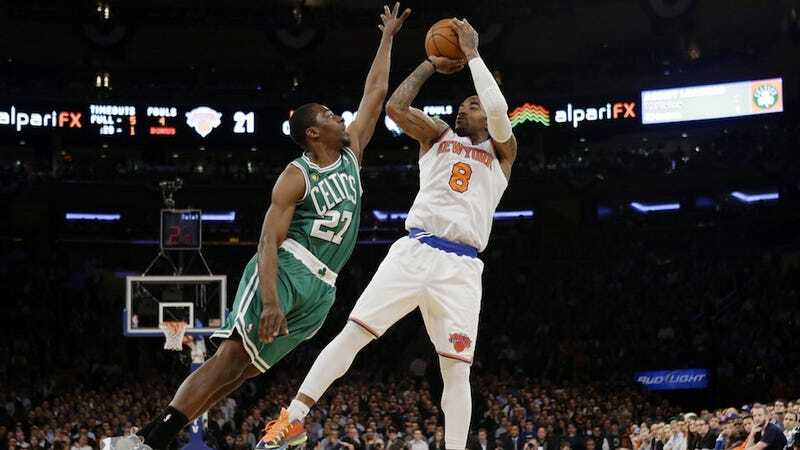 Sixth Man of the Year J.R. Smith, who added 19, including a spectacular sequence at the end of the first quarter. Then there's Kenyon Martin, who might've been the most valuable piece acquired by anyone on trade deadline day. That's when the Knicks traded Ronnie Brewer to free up a roster spot for Martin, rescuing him from the scrap heap for the league minimum. In 23 minutes, the 35-year-old Martin was the best defensive player on the floor last night. Seeking an answer to their own big man woes, the Celtics considered—and passed on—Martin several times this season, perhaps scared off by his malcontent reputation. "It was never about basketball," Martin said. "They might be kicking themselves now." Game 3 is in Boston on Friday, and it'll emotional: it'sthe Celtics first home game since the marathon bombings. But Doc Rivers has no time for hoary clichés about how a series doesn't really start until a road team wins a game. “I am positive the series has started because we’re down 2-0,” Rivers said.